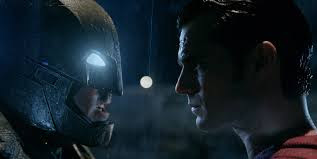 Let me get this out of the way early: Batman v Superman: Dawn of Justice is not the unsalvageable disaster many critics are making it out to be. There are a lot of really great ideas on display in this Man of Steel sequel, Ben Affleck's performance as Batman is pretty great at times and Gal Gadot's Wonder Woman is a joy to watch. Unfortunately, save for the Amazon serving as an exhilerating third-act deus ex machina, there's little joy to be found in this dour two hour and thirty-three minute superhero slugfest. Playing off the very real backlash to Man of Steel's Metropolis-destroying final battle between Superman (Henry Cavill) and General Zod (Michael Shannon), this film introduces us to a Bruce Wayne who's not only getting a little extreme in the crimefighting department — when he's not killing criminals, he's branding them with a bat emblem, which we learn will get them killed in prison — he's distrustful of Superman after the Last Son of Kryton leveled Wayne Enterprises' offices in Metropolis. Superman's not too fond of Batman's tactics either, and thanks to the machinations of Lex Luthor (who hates Superman because of his own issues with God and, apparently, his abusive father), the two are drawn together for a battle that has played out more than a few times in the comic books, including Jeph Loeb/Jim Lee's Hush and Frank Miller's groundbreaking miniseries, The Dark Knight Returns. In fact, director Zack Snyder borrows a lot from The Dark Knight Returns, including, unfortunately, Miller's utter distaste for Superman. Here, Superman is a hated, controversial figure, and it's his polarizing effect he has on the populace that makes Kal-El just as gloomy as his cowled rival from across the bay (in the Snyderverse, Gotham and Metropolis are a ferry ride away from each other). Snyder and writers Chris Terrio and David S. Goyer spend a lot of time and effort reminding us how dangerous and conflicted Superman is, robbing the titular fight of its appealing light vs. dark theme. Superman and Batman should be mirror images of one another. Opposites. Here, because the filmmakers often mistake maturity for grittiness (like a teenager who thinks they're grown-up because they use curse words), the core conflict of the movie falls apart. But maybe, as Kal-El reminds us during a pivotal moment in this film, Superman in the Snyderverse "was never real. Just a dream of a farmer from Kansas." Wait ... didn't Kevin Costner's Pa Kent die in Man of Steel to prevent his son from using his powers to help people and reveal his alien origins to the world? Did Batman v Superman seriously retcon a huge plot point in the last movie, or did Snyder and the writers forget to rewatch a film they worked on? It's easy to overlook things like that, sure, but if Warner Bros. is attempting a sprawling shared universe to rival Marvel's, inconsistencies like that add up. We don't want to repeat Fox's continuity mistakes with the X-Men movies, do we? Among those forthcoming DC movies, which include this August's Suicide Squad and next summer's Wonder Woman, we'll reportedly be getting a solo Batman film starring Affleck, which will hopefully explore the character's early years before he got so burnt out on crimefighting he started using guns and, yes, killing people. I know that Batman has racked up a death toll onscreen in the past, but if we're now setting Bruce up as the founder of the Justice League, he should probably have some scruples about taking human lives. But human lives aren't the only ones taken in this movie. There are MAJOR SPOILERS beyond this point, so stop reading if you'd like to avoid them. To kill Doomsday (Luthor's Frankenstein monster combining his own DNA with that of the deceased General Zod), Superman pierces the beast's skin with a kryptonite spear fashioned by the Dark Knight, and in doing so, he's stabbed through the heart, similar to how the fight between Supes and Doomsday went down in The Death of Superman. Yes, as if Snyder didn't already prove, through two movies, that he really isn't that interested in Superman as a character (which is why the screen version doesn't think or act like his comic book counterpart), he's killed him off and buried him six feet under so the Justice League can form without its central member. Great. Hopefully, when he inevitably returns (as hinted at in the final seconds of the movie), this movie universe will realize that having an invincible, flying dude who can shoot lasers out of his eyes is actually a good thing. Now that we're deep in spoiler territory at this point in the review, here are some other issues I had with Batman v Superman that I wish I didn't have. The very first present-day thing we see Superman do in this movie is punch a dude full-force through a brick wall. There's no way the guy didn't survive that. After the negative reaction to Supes offing Zod in the last movie, you'd think Snyder would have shown some restraint here. But it sure looked BADASS, right?! You could take Batman's entire "Knightmare" sequence, where he's snapping necks and shooting soldiers with an automatic weapon, out of the movie entirely and you wouldn't lose a thing. This felt like one of those over-the-top fantasies from Snyder's baffling Sucker Punch. They were jarring and disorienting in that movie, too. Martha Kent (Diane Lane) tells her adopted son that he doesn't owe the world a thing. Actually, seeing as how the Earth's sun is the source of his power and its people, namely the Kents, nurtured him from infancy, you could argue that he owes Earth everything since Krypton, you know, blew up. It's a burden that the comic book version of this character gladly takes on. It's what makes him a hero. A superhero, even. The reason why the Caped Crusader and Superman stop fighting is that Batman learns that both of their moms are named Martha. And not only do they stop fighting, they decide to team up. Batman even calls Supes his friend moments later (after he kills a dude, naturally). I guess deep-seated hatred based on fundamental and personal differences is fleeting after all. Batman's the World's Greatest Detective, but he can't tell that he's being manipulated by a millennial. You can reinterpret and reinvent Batman all you want, but being smart is kind of his thing. Bear in mind, I was really looking forward to Batman v Superman, so don't mistake me for a Marvel fanboy who was anxious to bash the competition. Superman was my first superhero, and I still binge-watch Batman: The Animated Series on DVD when the mood strikes. But amidst the stylized CGI chaos, the grimacing and the growling, I just wasn't having any fun. And if you're not having fun with superheroes, characters created for the sole purpose of escapist entertainment, then what's the point? We were all gobsmacked when we learned just a few weeks ago that a super-secret sequel to Cloverfield was on its way, but the biggest shocker is that Dan Trachtenberg's 10 Cloverfield Lane isn't really a sequel at all. Sure, it seems like this could exist in the same universe as the J.J. Abrams-produced found-footage kaiju flick, but the reality is that this is a different type of movie with very different storytelling sensibilities and, above all, very different characters. If you were hoping for T.J. Miller to return as a goofball camera guy, you're going to be disappointed. Without giving anything away (since the joy in this film is the mystery), I can say that John Goodman's Howard Stambler is one messed-up dude, and peeling back his layers of instability in the claustrophobic bunker setting makes for a disturbing, yet satisfying, moviegoing experience. Mary Elizabeth Winstead carries the rest of the film as the skeptical protagonist, Michelle, while John Gallagher Jr. helps balances out some of the omnipresent tension as the affable Emmett. That's pretty much it for the main cast in this slow-burn thriller, which spends much of its 103-minute running time confined to just a few small rooms. 10 Cloverfield Lane takes a bizarre left turn toward the end, and it's that narrative shift that might turn off some viewers. Personally, I loved where the story wound up, giving me the impression that we're seeing an anthology series unfold and we're just now realizing it. Is the primary threat in this movie related in any way to the monster that ravaged New York in the original Cloverfield? Is this series like The Twilight Zone in that it's made up of stories that have nothing to do with each other? There's plenty to ponder as we await the inevitable follow-up but, at this rate, the third film will leave us with yet more questions than answers. Plus, given the drastic differences between Cloverfield and 10 Cloverfield Lane, that movie can pretty much be whatever it wants to be. I'm hoping for animated cop drama starring anthropomorphic seahorses.